Each year, DIS is proud to host a few Visiting Faculty, professors who come from our partner universities that are willing to share their field of expertise with DIS students! M. Oluf Emerson, Co-Director of the Kinder Institute at Rice University, is a visiting faculty we were lucky enough to have for the entire academic year at DIS, as an expert in urban studies in the U.S. Find out in this interview what made Oluf such a wonderful asset to DIS and our Urban Studies in Europe program! 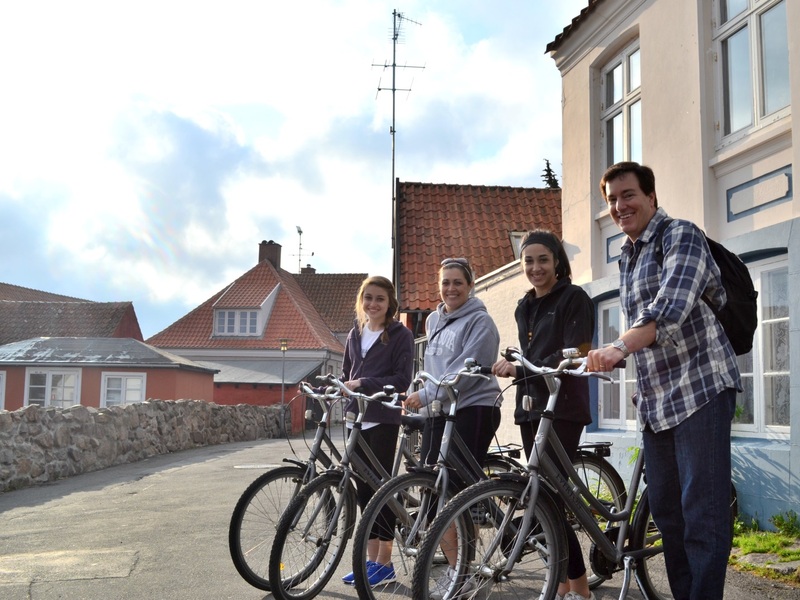 Oluf: Along with DIS students, I traveled on the Bornholm Bike DIScovery Trip. DIS: You are now wrapping up your second semester at DIS as a Visiting Faculty from Rice University. What inspired you to come teach at DIS and how has your experience been? M. Oluf Emerson: I visited DIS during an International Educators Workshop (IEW), a week when faculty and administrators from U.S. institutions come to see what DIS is all about. I was so very impressed by DIS and Copenhagen. As DIS was going to start the new Urban Studies program at the time, I asked if I might be part of teaching it for the inaugural year. Fortunately for me, DIS said yes! And here I am now, having spent the year co-teaching the new core course. DIS: You have helped to debut the Urban Studies in Europe program as a really successful academic program that students love. Tell us about the core course European Urban Life and Development and its highlights! MOE: I have had the honor and privilege of co-teaching the core Urban Studies course with Thorsten Wagner. We have complimentary knowledge and skill sets as he is trained as a historian and I as a sociologist. We were able to structure the course to take advantage of our unique training, and Thorsten is also a gifted study tour leader, which helped the overall course immensely. He has a deep knowledge of European city history. He brings that knowledge and city experience to the classroom—whether the classroom is at DIS or in the cities we visit. Oluf: On the bike tour for my Getting There: Transportation in Urban Europe course. We are on the sidewalk. To the left of us is a separate grade for the bike lane, lower than the sidewalk, higher than the road. The bike lane is wider than the car lanes. The same pattern is repeated on the opposite side of the street. On the corner is a traffic counter, recording the number of bikes that pass by. More than 40,000 bikes pass by each way, each day. That is far more than cars and buses. 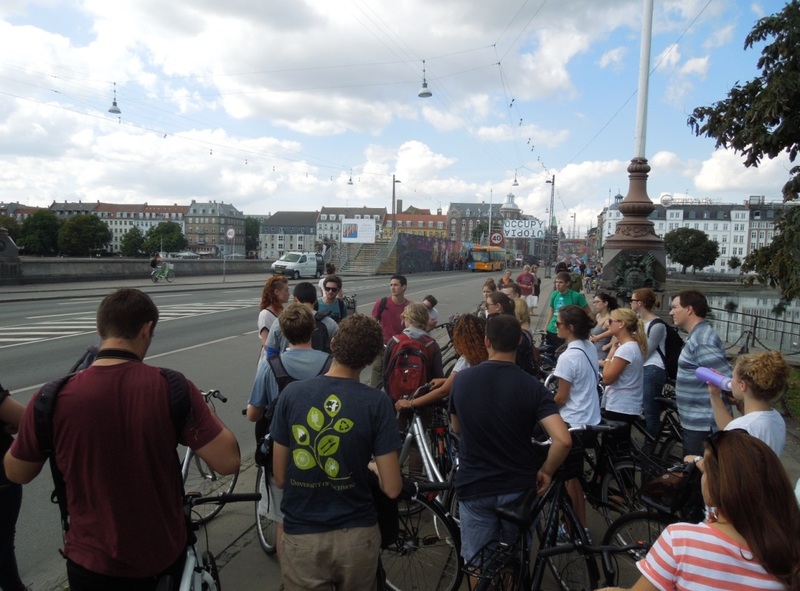 DIS: What makes Copenhagen a great city to learn about urban studies and urban development? How does it differ from Houston? MOE: Copenhagen is a world leader in areas fast-becoming the cutting edge of urban development and life—biking, city design and public spaces, green technologies, and social cohesion to name a few. The contrasts between Copenhagen and where I normally teach and live—Houston, Texas—couldn’t be greater. Copenhagen is a perfect setting for studying a model of what many other cities around the world aspire to be. DIS: During your week-long study tour for European Urban Life and Development, you traveled to both Budapest and Vienna. How do these cities compare in their urban planning? MOE: These cities provide vivid contrasts not only with each other, but with Copenhagen. Vienna, the music capital of the world, is a major German-speaking world city, and for our purposes is particularly unique in its social housing—about half of all housing in Vienna is social housing. Studying there allows students to see how issues such as gentrification and urban renewal might be approached differently than is typical in most cities. Budapest, as an eastern European city formerly part of the ‘iron curtain,’ is an exciting city to study because it is in many ways so ‘new,’ and has been able to freely develop only for the past 25 years. Students often find a youthful vibrancy in this city, a city on the rise, yet a city with an incredible history. DIS: This semester you are wrapping up some really exciting research with students in your elective course, Taking the Pulse of the City. Tell us about your Copenhagen Area Survey you have been working on for the past year. MOE: With the incredible support of DIS and my home university, the students and I were able to carry out a full-scale survey of over 1,000 Copenhagen area residents, measuring their views on major issues of the day and their quality of life in Copenhagen. The students have been a major part of every step—from developing the survey, to meeting with the survey company, to analyzing the results, writing reports, and even writing press releases. As I have told them, they have been part of creating real knowledge that can inform the city and be used by residents and policy makers alike. DIS: In the fall, you offered a course all about transportation, called Getting There: Transportation in Urban Europe. Can you tell us about this course? MOE: Europe and the United States are real contrasts in the decisions they have made about how to best move people around cities. For most U.S. cities, of course the car is king. Europe is fast moving away from the car in its core cities, and there is no better place to see this than Copenhagen. 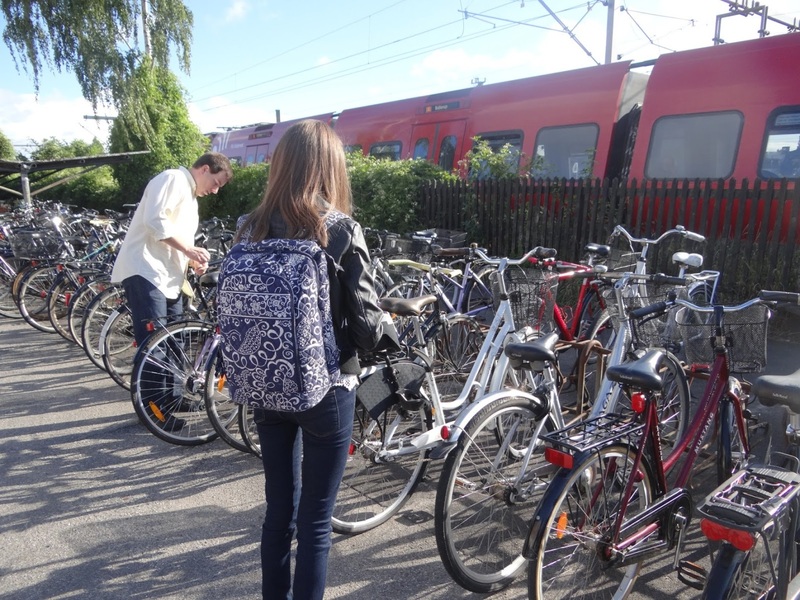 According to our Copenhagen Area Survey findings, an incredible 55% of people living in the city primarily commute to work on their bike. In our course, we studied why Europe is so very different in transportation design and decisions than the U.S. We also took a careful look at possible changes coming to city transportation. DIS: When you were in college, did you have the chance to study abroad? If so – where did you go? MOE: Sadly, study abroad options were rare when I was in college. I never even heard of such options then. Times have changed for the better. I have loved teaching at DIS this year for many reasons, one of which is the incredible opportunity it affords you to get to know the students better than you do at a typical U.S. college. Many of the students I have had at DIS have said the very same thing to me—they get to know their core course professors well. And the way learning is structured at DIS, you are able to learn in a different way—combing the classroom with consistent real world experiences in a different social environment. It is exciting. 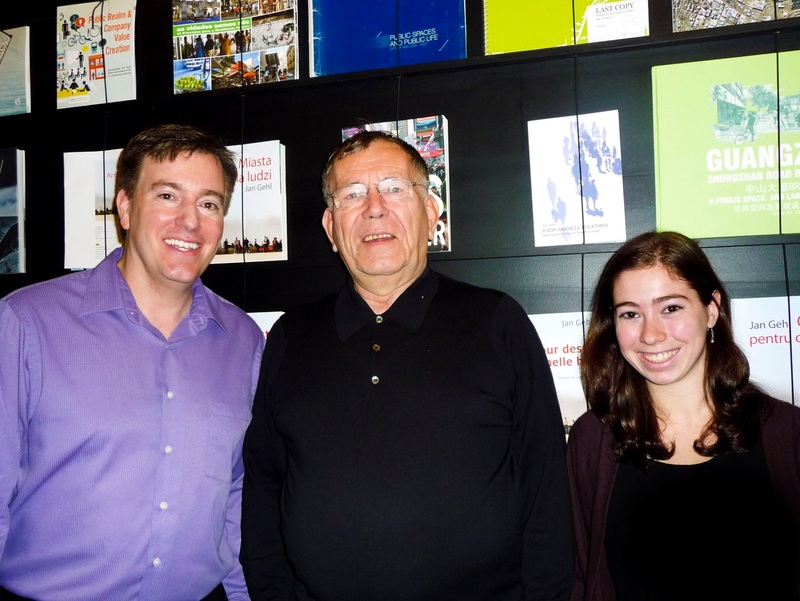 Oluf: I took European and Urban Life and Development student, Joelle Schindler, with me so that we together could interview Copenhagen’s world famous architect and urban designer Jan Gehl. DIS: What will you miss most about Copenhagen? Any advice for future students who will embark on a semester or year at DIS? MOE: Oh my, I will miss most everything. I have traveled the world and studied cities across the globe. Copenhagen is my favorite city among them. It is a city that truly cares about people, an amazing feat to observe. DIS is a fantastic place to be. The people care deeply about the students and about creating a welcoming, highly educational atmosphere. I simply know of no other place that does study abroad better than DIS.